I forgot to mention that the Ellen Sinopoli Dance Company, which got rained out back on August 22nd, is performing at 7 pm at Freedom Park in Scotia tomorrow (Sunday) night. I’ve already said that I love them. I actually think that we might do a last-of-the-season Jumpin’ Jacks dinner followed by the dance performance. I was reading the August Family Fun, and there was an article that began, “Kids dig salsa. . .” and my first reaction was, ummm really? Like, what kids? Not my kids. My kids think: hey, what’s worse than one vegetable? Several unidentified vegetables all mixed up together! Okay, perhaps I’m being a little unfair here. Lately, M’s enjoyed guacamole with some salsa mixed in, so we’re making progress at least. And, since I follow Ellyn Satter‘s advice to enjoy my delightfully healthy grown-up fare and allow them to get jealous and curious on their own, there’s nothing like a big bowl of salsa to convince my kids that mom & dad sincerely adore their veggies. 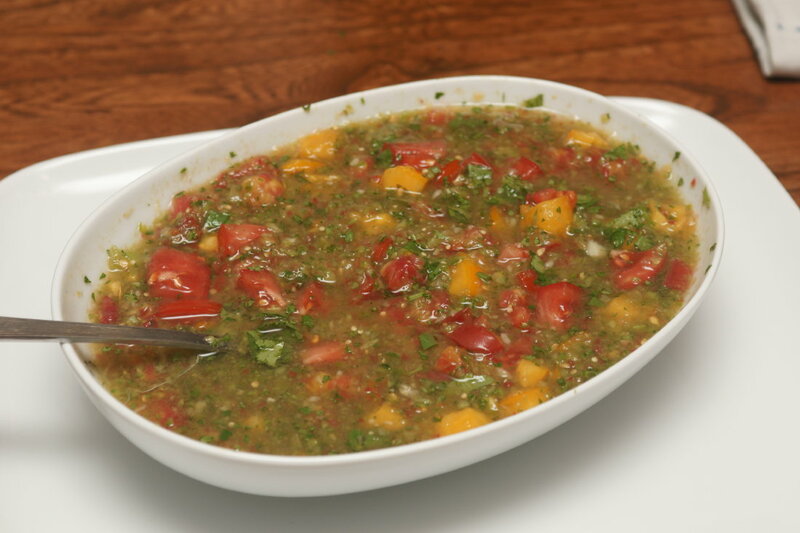 The other day we made salsa that was so beautiful that we had to take a picture of it to share. This is from a recipe that we started making pre-kids. I tried to just find a link to it, but the ingredients were a little bit off on the ones that I found. The version above used a variety of tomatoes, including a yellow heirloom–yum. Tomatilloes also grow locally, so you can look for them at your farmers’ market (along with just about everything else except the lime!). Finely chop garlic and jalapenos in food processor. Add tomatilloes and green pepper and pulse ‘til chopped. 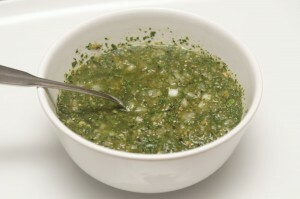 Add cilantro & parsley and one or two tomatoes, pulse until chopped. Remove and add remaining tomatoes, lime juice & salt. Can be served immediately; better if chilled several hours. 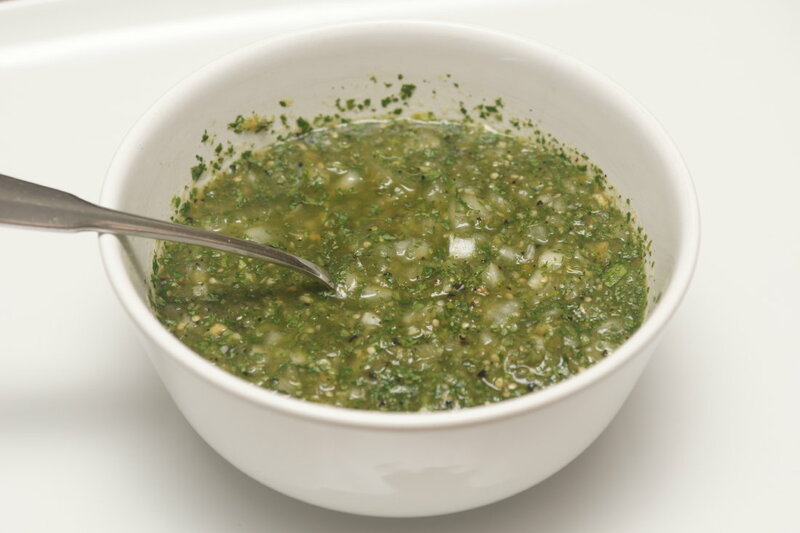 Another one we made was Rick Bayless’ Roasted Tomatillo Salsa, which is in his Mexican Everyday cookbook. Also delish, but better combined with his chicken tacos. Okay, as if it’s not bad enough that all of the summer programs end early and the beaches close because the college kids are leaving for school, has anyone noticed that there seems to be an end-of-summer-malaise? I hate this. It bugs me every year. We’ve got freakin’ gorgeous weather now, but when I take the kids to the town pool, is anyone there? No-ho! They’re all done with summer! I remember this particularly from the autumn when J was born. She was born on October 1st, and right around the time that she arrived, I kept bringing M to play at playgrounds. My reasoning: I am going to be trapped in the house all winter with these two little girlies, and I’d better get as much fresh air and sunshine as I can, while I can. But on any given day, it would be, say, in the 60s, and it was too cold for everyone! The playgrounds were deserted! When we all know that if it were April or even May in the 60s, we’d all be outside and the kids would be breaking out the sandals. But alas, the playground then, like the pool these days, is no fun when there’s no one there who wants to play, too. Hopefully it will be better this week. This morning my kids had no particular desire to get outside. We kept pointing out the beautiful day until we realized that we were pointing out the beautiful day from inside. So we went outside and puttered, then took a bike ride, and the girls haven’t been inside since (knock on wood). In fact, while they played happily, W & I snuck inside and took a little rest!